Get at those hard to reach clients! Our wood backscratcher provides relief for itchy skin and features a roller for massaging sore backs. They are a perfect promotion for chiropractors offices, medical offices, retirement homes, spas and more. 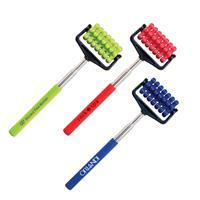 Two color imprint only available by the roller location on backscratcher. Get at those hard to reach clients! 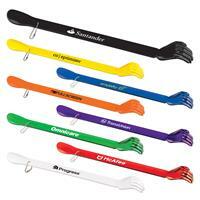 Our plastic backscratchers are a perfect promotion for chiropractor offices, medical offices, retirement homes, spas and more. Features a shoehorn on one end as well as a chain for hanging. Plastic. Available in black (S16132X), translucentt blue (S5821X), translucent green (S5820X), translucent purple (S7822X), yellow (S7821X), white (S5823X), translucent red (S5822X), and orange (S50102X). One location imprint only. Relax! This promotion is sure to reach all your anxious clients. Our extendable massage roller extends 23"! A perfect promotion for spas, salons, chiropractor offices, medical offices, retirement homes and more! Available in red (S71059X) green (S71060X) and blue (S71058X). Get at those hard to reach clients! 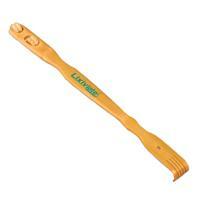 Our wood backscratcher provides relief for itchy skin and features two rollers for massaging sore backs. They are are a perfect promotion for chiropractors offices, medical offices, retirement homes, spas and more. One color and one location imprint only. Get at those hard to reach clients! 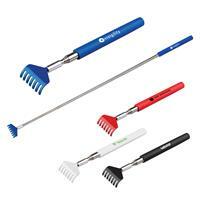 Our extendable backscratcher extends 22 1/2"! A perfect promotion for chiropractor offices, medical offices, retirement homes, spas and more. Available in black (S71014X), white (S71015X), red (S70485X) and blue (S70484X). One color imprint only. Get at those hard to reach clients! Our wood backscratcher provides relief for itchy skin. They are are a perfect promotion for chiropractors offices, medical offices, retirement homes, spas and more. One color imprint only.